Guardian Bulk M42 is a 10RU high 19” rack-mounted, 1200 Amp DC power system providing a bulk output of -48VDC. The Guardian Bulk M42 1200 Amp DC power system incorporates 6 rectifier shelves accommodating up to 23 Guardian family high efficiency hot-swap rectifiers. A maximum total current of 1200A (N+1) is available. The rectifiers are internally fan cooled with speed control which is a function of load and temperature, keeping acoustic noise to a minimum. Guardian Bulk M42 1200 Amp DC power system incorporates the ACX Advanced controller which monitors system parameters, controls rectifier output, and provides alarms for system failures. The controller is hot-pluggable for easy field replacement in case of failure. There are 2 LED alarm indicators which indicate failures, (RED) Alarm and (YELLOW) Message. A third green LED indicates the controller is working properly. As standard ten form-C relay outputs provide the alarms for remote use. Two digital inputs and outputs are also provided as well as an SD card with sufficient capacity for more than 20 years data logging. The controller can be programmed by means of a remote PC web page display. Communication is by Ethernet LAN with SNMPv3 including alarm trapping. It also has provision for temperature compensated charging of an external battery. An LCD Display/Touchpad is included for local metering, status, and setup. 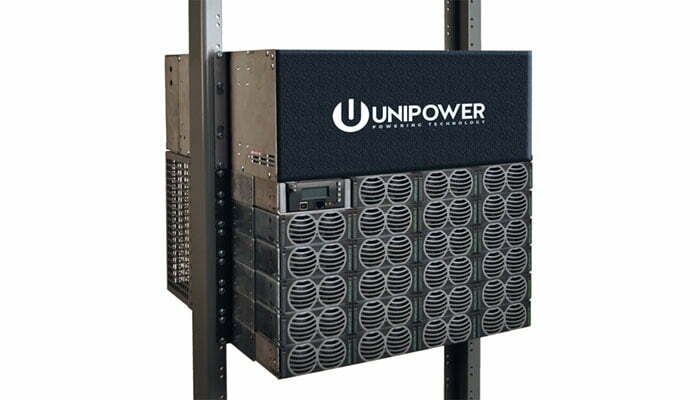 Guardian Bulk M42 1200 Amp DC power system is compatible with UNIPOWER’s free PowCom™ software which offers local and remote management through an advanced Windows GUI. Bus Bars Lugs - ½” on 1¾” centers or ⅜” on 1” centers with oversized washers. Battery Disconnection System can provides voltage controlled disconnection of batteries using and external LVBD.